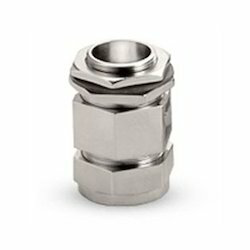 Pioneers in the industry, we offer emc cable glands from India. We are involved in manufacturing & exporting a broad spectrum of EMC cable glands which are widely used to provide electromagnetic protection. These glands help in maintaining the electromagnetic integrity of the shielded cable by just tightening the gland. Apart from the standard size, these are also offered in customized form. Looking for EMC Cable Glands for Cable Industries ?